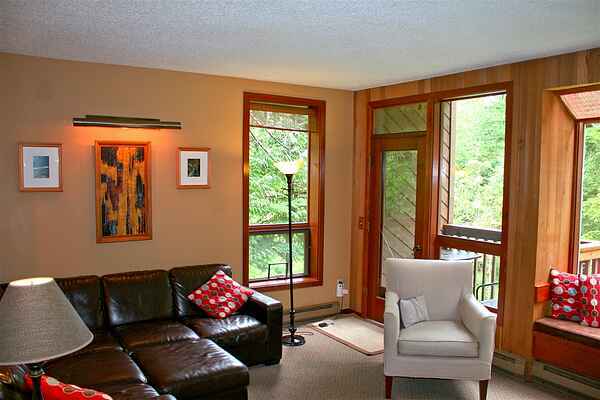 This spacious, 3 bedroom, 2 bath, ground floor condo is a secluded family getaway! Features include a master bedroom with 1-king bed and private walk-out balcony, a full bath with a soaker tub, a shower and sauna room, one bedroom with 1-queen bed, another bedroom with 2-sets of bunk beds, another full bath, a fully equipped galley style kitchen, a large dining area, a spacious living area with a wood fireplace and a walk-out porch with peek-a-boo river views. All this, plus great Snowater amenities, at a great price! This vacation property will sleep up to 8-persons (ENFORCED Maximum Occupancy).